Bring your decades-old HMI up-to-date with our cost-effective HMI upgrade solutions to meet the challenges of the 21st century. The CSI Interface product line was developed as an OEM alternative replacement to the current GE , & ™ operator interfaces for MkIV* & MkV GE Speedtronic™ turbine control panel systems. As a complete solution, the CSI software uses our operator graphical interface, providing OneVue / LDR Historian as an option. With the ability to perform all the normal functions of the currently installed GE interface, this product goes a step further by allowing for flexible and detailed preventive maintenance analysis & troubleshooting not currently available until upgrading to GE’s MkVIe™. Based on these advantages and features, the CSI product line is the premier solution for turbine control management, performing far beyond the capabilities of the OEM equipment. Our system includes standard modules for: real-time tags and assets database, user templates, alarms and events, historian, SQL tables and queries, recipes, XML, CSV, XPS and PDF reports, built-in embedded SQL database engine and web server, scripting, scheduling, OPC server and client, native communication protocols, graphical designer, with native runtimes for .Net, Web, iOS, Android, Windows Compact Framework (Windows CE), Linux, and Raspberry Pi (rPi). The CSI product line is an effective way to modernize your current turbine control systems, increasing the operational lifetime of your capital investment by integrating a variety of solutions. The CSI system can also be used to consolidate multiple on-site OEM devices (Allen-Bradley, Fanuc, Siemens, etc.) 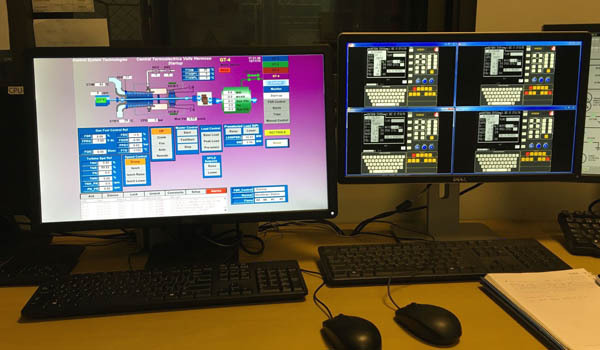 into a single system application with a common look and feel, successfully modernizing and upgrading your turbine control systems. Built-In Editor User-Friendly text editor, allows for the inclusion of tables, images, hyperlinks and text formatting. Supports Text, HTML and XPS Save your reports in multiple formats. XPS format allows easy deployment in distributed environments. Copy and Paste from Word If you prefer to edit in Word or an HTML or RTF editor, just copy and paste your content. Easily embedded real-time tags With one click add real-time data values on reports. Multiple alarm conditions Hi, HiHi, Lo, LoLo, RateOfChange and Deviation. High resolution Millisecond time-stamp; when available uses the remote IO time, not the computer time. Built-In visualization object Online and historical visualization object, run locally and on the web. Alarm group and item objects Access Alarm properties directly, e.g., “total alarms active”, with no requirements to create application tags.